 Psychologist Thurer offers a historical smorgasbord of societal attitudes toward mothering, from the paleolithic period to the present. She views the Stone Age as a golden period for women: The prevalent divinities were powerful, complex mother goddesses, revered for their seemingly magical ability to bear children. By 600 bc, the patriarchy's ascendancy signaled the beginning of a long downward spiral for the status of mothers and, by extension, of children. In classical Athens, misogyny was particularly virulent; women were marginalized, and infanticide appeared to be the preferred form of family planning. Medieval and Renaissance Europeans venerated images of the Virgin Mary and her divine child, but in real life, deaths of infants (particularly girls) due to neglect and abandonment reached epidemic proportions. Throughout much of later European history, women who fit the mold of the submissive, fertile wife were idealized, albeit patronized, while unwed mothers were vilified and sometimes put to death. By the early 20th century, as medical advances made survival of birth more likely for both mother and child, ``scientific motherhood'' arrived. A stream of manuals offered advice on raising physically and emotionally healthy children, paving the way for psychological theories that blamed women for all their offspring's emotional ills. Recently, though, says Thurer, the image of mothers has been revitalized by feminist authors who portray them as loving but with a realistic range of emotions. Mom is finally becoming a person. Many of Thurer's conclusions, particularly those concerning early history, seem open to question, based as they are on scanty evidence. And there are some distracting factual lapses. (The Immaculate Conception of the Virgin Mary means that from the time she was conceived she was without original sin--not that she was conceived asexually.) 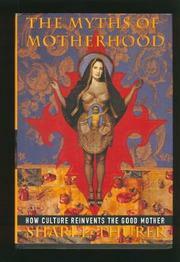 Nonetheless, Thurer effectively demonstrates how transient any one view of mothering really is.